Weeds are a major scourge for organic growers, who often must invest in multiple control methods to protect crop yields. A relatively new weed control method known as abrasive weeding, or “weed blasting,” could give organic growers another tool. The method, recently field-tested at the University of Illinois, is surprisingly effective. In conjunction with plastic mulch, abrasive weeding reduced final weed biomass by 69 to 97 percent compared to non-weeded control plots, said U of I agroecologist Samuel Wortman. Wortman found no significant differences between the grit types in terms of efficacy. “When it leaves the nozzle, it’s at least Mach 1 [767 mph],” Wortman noted. “The stuff comes out so fast, it doesn’t really matter what the shape of the particle is.” Because ricocheting particles can pose a risk to the applicator, Wortman advises using protective eyewear. An additional benefit of weed blasting is the potential for growers to use organic fertilizers, such as soybean meal, as blasting material. “We expect that abrasive weeding could contribute between 35 and 105 kg nitrogen per hectare [31 – 94 lbs per acre] to soil fertility.” The idea that a grower could both fertilize and kill weeds in a single pass is appealing, but it is still unknown whether the fertilizer would be available for plant uptake within critical windows. According to Wortman’s research, weed blasting does affect some weeds more than others. Essentially, the smaller the seedling, the better. Also, seedlings whose growing points are aboveground (annual broadleaf species) are more susceptible to blasting than seedlings whose growing tips are located belowground (grasses and broadleaf perennials). Finally, Wortman noted that the presence of plastic mulch seemed to factor strongly into the equation. Weed blasting alone “is not a silver bullet, but it is an improvement,” he said. The method is now being tested in different horticultural crops, including broccoli and kale, with and without additional weed control methods. Early results suggest that the presence of polyethylene mulch or biodegradable plastic mulch strongly enhances the success of weed blasting, as compared with straw mulch and bare soil. 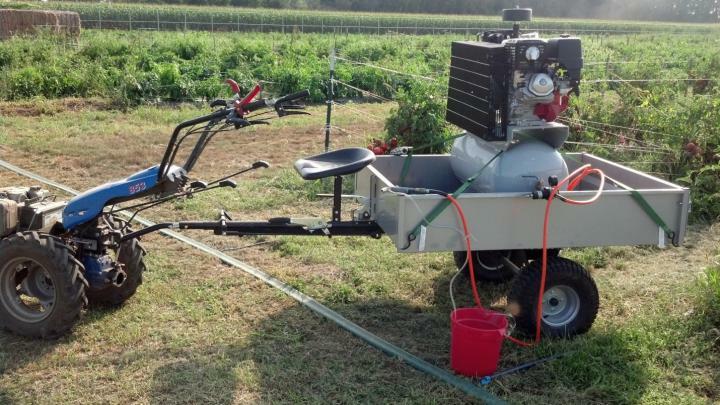 Wortman and his collaborators have also developed a mechanized grit applicator, which they are currently testing.